Posted by nrhatch in Art & Photography, Nature, Travel & Leisure. The Ocean . . .
I’ll be looking for your submission. I wonder if seasick can be used to mean sick FOR the sea? Oh, I miss it today, Nancy. beautiful poem. I grow homesick for the sea when I cannot hear its heartbeat. No thanks. I have to take motion sickness pill to go into the bathtub. We’ve seen the ocean misbehave. I miss relaxing on the beach watching all those activities in your verse and the ocean with sunbeams dancing on its waves. Thanks, Carol Ann. Glad you enjoyed. I am at my happiest when close to the sea. The ocean always me feel so alive, I could watch it for hours. Our first time to Acadia National Park (in Maine) we sat on the rocks above the sea for hours doing nothing but watching the waves pound against the shore. Thanks, adee. I enjoy wild crashing thundrous waves too . . . but not tsunamis. Me too. I kept changing the ending until that last line arrived. I nodded. 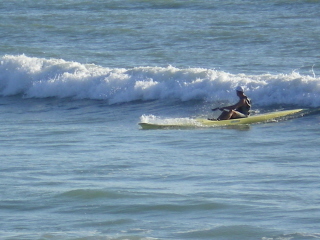 I want to kayak on the Gulf of Mexico, and ride up and over the undulating waves. Thanks, Ruth. I’m glad I stuck with it until that last line appeared in view.